The Seeed Fusion PCB Assembly service can be found in the tab under the PCB order section for both quickturn PCB and Premium PCB manufacturing services. You will need to prepare a Bill of Materials (BOM) file in a specific format – BOM files exported directly from design software like Eagle and Altium are not compatible. For more guidance on how to structure the BOM file, please refer here. When you are ready to order, just complete the PCB section as usual, open the PCBA tab and upload the BOM file. The system will then read each MPN value and try to match it with live pricing from websites like DigiKey and Mouser. If a match is found, the pricing will be calculated and shown on the right-hand side. Here you can see a brief description, the price you will pay for each component, the quantity of each component, and the waste quantity. The waste quantity is the number of extra pieces purchased in case of production losses during assembly (calculated roughly as 5% extra). As with all manufacturing processes, production losses are unavoidable. 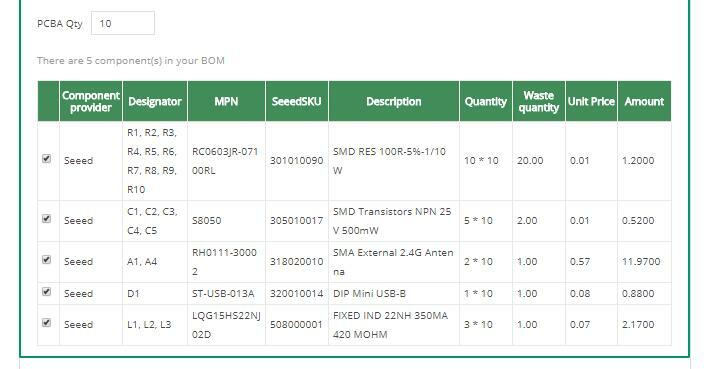 Seeed OPL parts will have the Seeed SKU displayed whereas externally sourced components will have the fixed SKU of 508000001. If all parts are from the Seeed OPL, PCBA production time can be reduced to just 7 days. Modify the quantity of assembled PCBs required and the price will update accordingly. The PCBA quantity can be lower than the PCB quantity. We will send you the remaining PCBs with your order if they are in excess. If the price is acceptable, add the order to the cart and checkout as normal. Congrats! You just placed a PCBA order with Seeed Fusion! - Part not found? If the system cannot match the part, we can still provide you with a quote but this will have to be reviewed by the procurement team first. After uploading the BOM, the platform will give you the option to provide a part description link. This will help our procurement team source the correct part via our own supply channels. If you have already included the link in column D of the BOM file, this will be pre-filled for you. Add the order to the cart and your quote request will be automatically sent to our procurement team. They will aim to provide the full quote within one working day. - Please include an XY/pick and place/Centroid file in the PCB upload if possible. We probably won’t need it but in some cases it is mandatory. By including it in the upload in the beginning, we won’t need to ask you for it later. - Keep an eye out on your e-mail inbox! We may need to contact you at any point regarding problems for PCB manufacture, components sourcing or assembly.